A few of us travelled down to Manchester for the British National Track Championships on Thursday night, to be ready to race on Friday, Saturday and Sunday. This was the first time the Nationals had been held over just a weekend, rather than the full week, a move designed to make it more TV friendly, so it would be a fairly busy few days for us. First up for me was the Keirin, my favourite event! I was not feeling the best for this, as the anticoagulant medicine I am on has made me lose my appetite a little, so I am struggling to eat as much as I usually would. However, the training and racing must go on. The heats were all going to be pretty tough, with most of the GB squad girls racing, and with just the first two progressing through to the next round. Realistically, I was hoping to win the repechage and progress through from there, as this was likely to be the only way I was going to get through. However, during the last lap of my rep, a rider came down and got her pedal stuck in my front wheel! I’m glad my bike handling skills are fairly good and I managed to save myself from crashing. I then had to pedal down the back straight with one leg, after unclipping from my straps I felt happy that I’d managed to save myself from hitting the deck, when all of a sudden, the tyre blew on my front wheel and I came crashing down just after the finish line. As much as I was annoyed I was out of the Keirin, I was more relieved I hadn’t come off too badly; just some minor scrapes and a burst front tyre (which was on a borrowed wheel, as I’d had three punctures already that day), whoops! The following day was the Sprint. I knew I was unlikely to progress any further than the flying 200TT used to seed the heats, but as I was using the rest of this year as a training block, I just wanted to crack on and see how I would go. Predictably, my 200TT was rubbish, but in every competition I’ve entered, I have found that I am gradually getting back to where I was before the blood clot, so there are positives too. As I didn’t qualify for the next round, I headed back to the house to chill for a bit, before heading back to the track later to cheer on the rest of the guys on. Sunday was the Team Sprint, and I was racing “man2” with Neah Evans. This was a big gamble for me, as we had only done one training session together, and to be fair, my sprinting leaves a lot to be desired. We raced: it wasn’t the best, but we didn’t disgrace ourselves, and then we had the 500TT later that same morning. 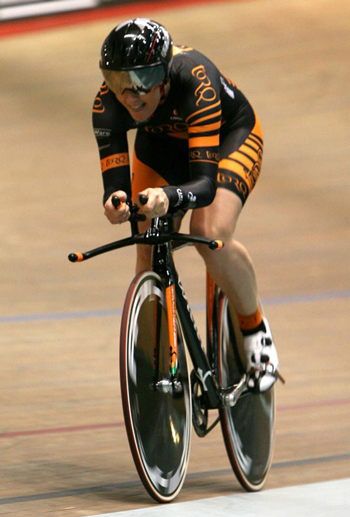 Again, this is an event I’m not that great at, but I was just looking to improve on my time from the Scottish Champs – which thankfully I managed – and to dial in the starts before the World Masters Track Championships. So that was “The British” (as we call them up here in Scotland!) over for another year. Not the results or the times that I would have hoped for, but on a positive note, I’m recovering and I’m so glad I can still ride my bike, train and hopefully get back to being fully fit a few months down the line. Now, whilst all my training buddies are having a well deserved two week break, I’ll be back in Manchester next week for my first World Masters Championships!